Situated 20 miles northwest from downtown Atlanta, Marietta lies in the heart of Cobb County, with Kennesaw to its northwest and Smyrna to its southeast. Positioned in Hardiness Zone 7b, Marietta, Georgia has a humid subtropical climate with winter high temperatures averaging 54 ℉ and 88 ℉ through the summer. The City of Marietta Parks, Recreation and Facilities tends to an astounding 18 parks with amenities and activities for everyone. With beautiful greenery surrounding, Marietta established a tree protection ordinance that serves as a clear guideline for the lawful removal and preservation of its trees. Following is an excerpt from www.treeremovalpermit.com/georgia/marietta-ordinance-permit-city-arborist/ covering the Marietta, Ga tree removal permit process and its tree protection ordinance. These steps will assist you in the lawful removal of dead, dying, diseased or hazardous trees from commercial or multi-family dwelling properties. 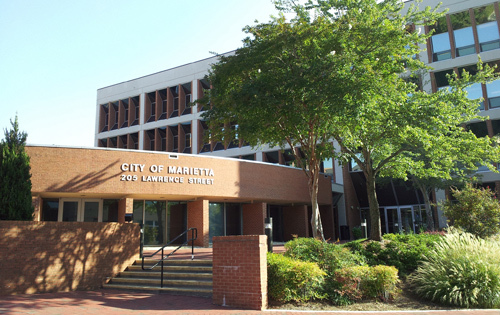 Step 1 – Download the Marietta Tree Removal Permit Application form. Step 2 – Fill out the form. NOTE: City staff will verify the project or condition of your tree(s) and issue a decision within 10 days from receipt of all required documents. Major land work within the City of Marietta Georgia requires the completion of a Land Disturbance Activity Application. The tree removal permits are not issued until the plans have been reviewed and approved by the Department of Development Services. If you have a tree emergency or need assistance from a local tree service, we vetted this team of professionals to assist in the removal of dead, diseased, or hazardous trees. This team is also prepared to guide you through the application and permitting process.